Thanks. I thought it up all by myself. Good to have a goal! The best plan of all! 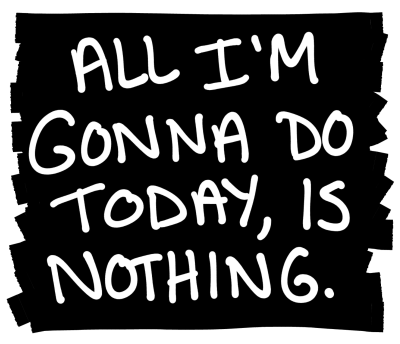 A big fat nothing kind of day is the best. I think I'll do the same if you don't mind me copying. Please do. Love the new do, you're looking super duper cute. It's a goal I can hit today. Looks like you got some thoughtful gifts, and to me, that's super special. Happy Christmas & Happy 2015. We don't have TV, cable or regular but Frankenberry will listen to the homers on the radio. Enjoy your game. I wish I could...but I've got to get my brain ready for New Year's Eve! Well I hope somewhere in all this nothing you find time to eat ! Hey, that's my plan too. Miss CP just texted me and asked my plans for the day… I'm still in my PJs and I'm deep in the woods as I follow a band of really bad dudes as they try to outrun the really good dudes… their names are way over my head so they're all dudes. Or dudettes, depending. Enjoy the nothingness of your day! Hmm? What To Do? What To Do? Friday Question: Food or Seating?